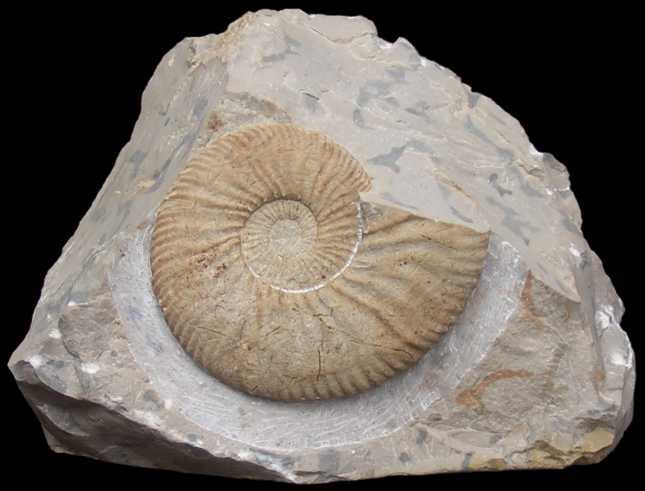 The Perisphinctaceae are a group of ammonoids known from the middle Jurassic to the early Cretaceous, characterised by evolute conches with sharp-branched ribs and complexly differentiated suture lines. The morphology of the aptychus is known for several families in the group, with the majority possessing a praestriaptychus with weak concentric striae. This aptychal morphology is probably ancestral for the Perisphinctaceae, with the granular granulaptychus of Perisphinctidae and smooth laevaptychus of Aspidoceratidae representing derived modifications (Enseger & Kaup 2002). [H02] Haubold, H. 2002. Literaturbericht: Ichthyosaurier und Sauropterygier. Zbl. Geol. Paläont. Teil II 5-6: 367–403. [SY85] Sha J.-G. & Yuan F.-S. 1985. Buchia fauna from Dong’anzhen Formation near Dong’an of Raohe County, Heilongjiang. Acta Palaeontologica Sinica 24 (6): 651–662.